About a month ago I teased you with photos of a lovely lace shawl on the needles, but never showed you the finished shawl. Well, wait no longer. This is the Minarets and Lace shawl by Mary-Anne Mace. I knit this for a friend to gift to one of her family members. My friend is a knitter herself, but her busy schedule couldn’t accommodate one more item. So she provided the yarn and the pattern, and I provided her with a finished knit ready for gifting. In the process, I had fun knitting a project I otherwise wouldn’t have done and I learned some new knitting tricks. Wins all around! I am very happy with how this project turned out. Once I figured out my trick for finishing the nupps, the knitting went fairly smoothly. 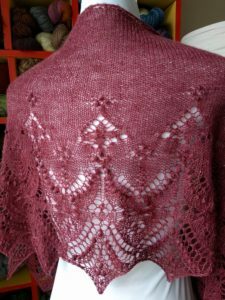 I have eyed several lace patterns containing nupps before, but never tried them. Now I’m confident enough to take them on. The pattern was well written and clearly understood once I got into the work. Reading the pattern through before getting started also helped to get the scope of the work to come. That said, this is not a beginner or intermediate lace project. Since I was working toward a hard deadline, I figured out how many rows I would need to complete each week and stuck to that schedule. Some weeks I was able to get in more knitting time than in others, so I finished well ahead of schedule. My only frustration with this pattern was the special stitch ‘5 from 5.’ Basically, you work a series of knit five together into the same five stitches. It creates what resembles a little gather or bloom within the body of the knitting. In this case it also created an uneven band in the work where the stitches pulled more than in the rest of the work. I can see it in the pattern sample photos too, now that I know what I’m looking for, so it’s not just me. I like the concept of the stitch, just not how it was executed in the pattern. I loved the yarn my friend chose for this project. It is a blend of merino and silk in a lace weight. So heavenly to work with! The blend is a little on the nubby side – with little silk bubbles every so often – a quality which my friend really liked, even in the lace. We had a bit of a scare near the end regarding yardage though. I used every last inch of one full skein of this yarn. Seriously, there was no extra long cast on tail or anything like that. So close! 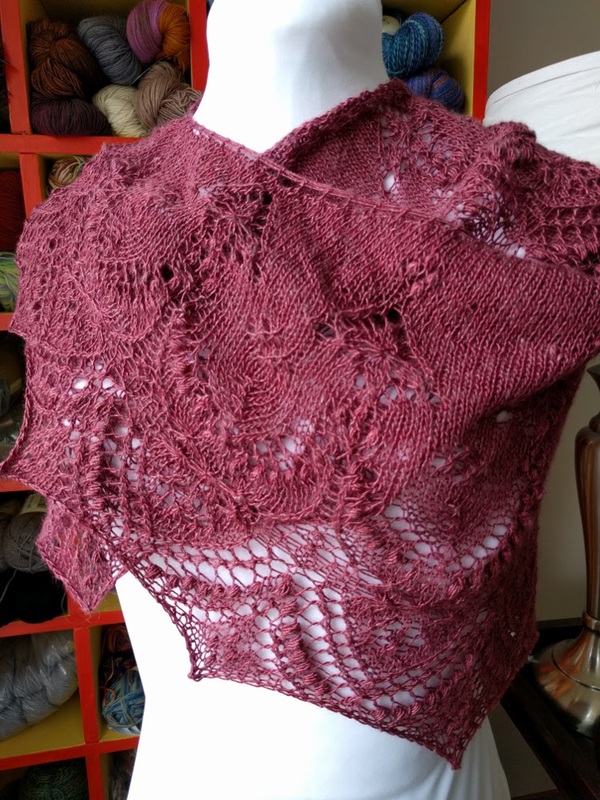 For blocking, I followed the designer’s suggestion for where to insert blocking wires to pull the edge out into points that highlight the lace patterning. This came out very well. I like that the designer was very specific here – most patterns assume that the knitter can determine how to block the piece to match the photographed pattern sample. In all, this was a good knit. Relatively fast too, even with the complexity. 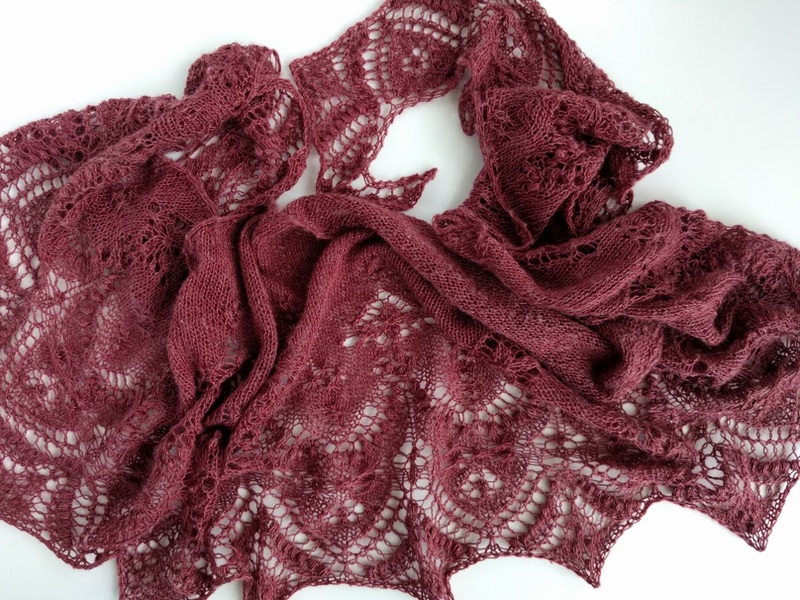 This entry was posted in Knitting and tagged knitting, lace, shawl, silk, wool. Bookmark the permalink.